Your Sales Team Completed Training, Now What? Feedback vs. Coaching, What's the Difference? Why Staffing Professionals Must Practice Role Playing "Discovery"
Your New Hires Completed On-boarding, But Can They Execute? Is Adding Sales Headcount the Best Path to Revenue Growth? Six Ways to Ensure Your Sales Training "Sticks"
Need More "A" Players In Your Organization? Try These Three Tips. Can Your New Hires (Sales Reps) Effectively Engage Prospects? Which Does Your Team Need, Sales Process or Sales Methodology? Are you an "Old School" or "New School" Sales Leader? Will Your New Hires Contribute To Your 2017 Revenue Target? Staffing Managers, Are Your Recruiters Just Sourcers? My IT Staffing Firm Has a New Sales Methodology. Now What? Sales Methodology vs. Sale Process: What’s the Difference and Why Does it Matter? 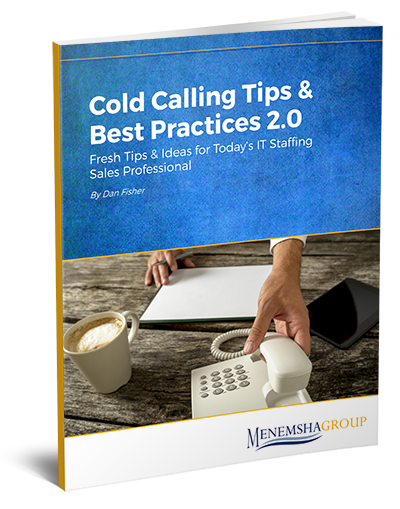 Checklist: Is Your IT Staffing Firm Hiring the Wrong Sales Managers? Can IT Staffing Firms Make More Money in 2016? Is Selling IT Staffing Services an Art or a Science? How Long Should Your IT Staffing Firm’s Sales Training Last? What is Your LinkedIn Ranking? Account Management: Reactive or Proactively Adding Value? 2015 Sales Attack -- Two Things You Must Know! Developing Your Business Acumen: What it is and How to Develop it. Too Much Perm, Not Enough Contract Orders? Hmmmm. No Client Feedback? Job Orders Not Closing? How Well Do You Know Your Candidates? A Sales Funnel, What’s That? IT Value Is Dead. Long Live Business Value. "I’m Happy With My Current Vendor"
It’s never too late for NOW. Consult with your clients today! Not sure how to hit your 2011 sales goal? Read on. Frustrated With Long Sales Cycles? How Do We Sell Differently? How Can I Quickly Identify Good Accounts? "You Mean You’re A Body Shop?"